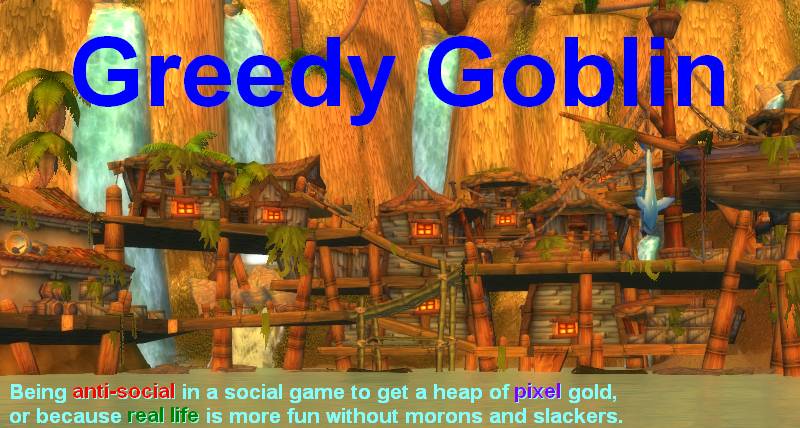 Greedy goblin: I knew Goons are desperate, but I didn't see this coming. I knew Goons are desperate, but I didn't see this coming. As the Evil Imperium optimized its operations for large fleet combat to take and protect land pre-FozzieSov, they measure everything by paplinks: be in fleet to press F1, click on link to prove it. Because of this, they can't value PvP-ers and kicked MoA from their coalition. With a little help from me to run SRP, they became the #1 Imperium killers. The minions of Evil are totally defenseless against the guerrilla warfare of MoA and lose ship after ship with noting to show in return. Since I run statistical calculations on the data of the killboard, the usual "our killboard is still green, you are just content to us" propaganda doesn't help either. The old "we are stronger than ever" self-assurance doesn't really work when they have about half the land they had a year ago. The cabal of the Evil pulled a desperate stunt to stop MoA. The reason why there was no post about it from me is that I simply didn't believe it and waited for some new info with some reasonable explanation. But there is none. The Imperium really destroyed their own Revenant supercarrier, after the pilot got himself invited into MoA, claiming to be a defector super pilot. This way the killboard of MoA now has a Revenant loss and is ruined for this month. Yes, you read it right. The Imperium sacrificed the most prized ship of the game to do something against MoA instead of just sitting and dying. The plan was obviously that MoA pilots will be demoralized seeing their precious killboard in red. What the minions of Evil don't understand is that the killboard is a measurement of the performance and not the goal of it, so the killboard was never precious. It's a tool like the stopwatch for runners. They want to run faster than the competition, if you mess with their stopwatch to show 20 seconds for 100m, they might be annoyed for being unable to track their improvement, but they won't be demoralized and won't stop running. In the meantime SMA was being SMA and FCON was being FCON. PS: accepting a Revenant pilot was still dumb from MOA leadership. What could they do with the Revenant if it's legit, besides keeping it logged out? The pilot should have been told to sell the Rev and donate its price for the SRP to prove his commitment for the noble cause. Or if he fears scam (donate but doesn't get invited), just spend it on sub-caps solo hunting CFC and get a killboard full of dead Imperium and losses from them. Actually, the Imperium sacrificed "Boat's Goat" as fun way to end the summer before Fozzie-Sov and get everyone on a killmail for a Revenant. The MOA bit was something that was just icing on the cake. The entire plan, lead up, and announcement to the party (which has been planned for more than a month) never even mentioned that unintended consequence. So, while I can see why you'd want to think that the ebil Goonies are desperate, this was anything but. How much can you be winning if the CFC can afford to throw away a Revenant like this? Once again you fail to realize that you are judging the CFC to a metric (ISK efficiency) that they do not really care about. Like the bridge fighter in Arathi Basin, you are only winning because you are using a different metric than your enemy. Might be also the case, that all was done just for fun? To the guy that said that the MOA thing was the icing on the cake: TMC reports something entirely different, and apparently the Goons are all vewwy pwoud of their aweshoooooome ruse. you are blind of hate against goons. it is just a cherry on the cake that dbrb managed to get the revenant into moa. good it was a laugh. if he would really destroy their killboard, he would have not killed 420 goons with this super. and please stop saying that a organisation becomes weaker, if it abondons space or in rl words weak structures/companies. consolidating makes you more efficient and gets you stronger. also it is smart move for fozziesov. it did not hurt their military power as this is not measured in sov. if this would have been the case N3 would have slaughtered all eve with the biggest empire. but as you see they failed and what is left? the cfc/imperium stronger then ever with no real enemy. Er, how does a last-second stunt they'd have done anyway, even if MoA didn't fall for it, mean it was supposed to stop them? Looks like they are taking their new moniker to heart and have started throwing the enslaved minions some bread and circuses (a circus held in 10% tidi). The game must get very dull paying $15 a month to play a pawn in a metagame whose purpose is to deny content at all cost and make leaders real life ad revenues. Well jeez, if the entirely impartial and rigorously journalistic TMC reports something, clearly it must be true. I think your eating of this up as presented to you is proof that people are just as dumb as the Goons think they are. They did this for fun, managed to put a neat little twist on it, and presented it as being their plan all along. And lo and behold, the interact reacts as expected. "Once again you fail to realize that you are judging the CFC to a metric (ISK efficiency) that they do not really care about. Like the bridge fighter in Arathi Basin, you are only winning because you are using a different metric than your enemy." Interesting comment. By what metric does Goonswarm measure their success? Is it something that can be measured and agreed upon by all parties easily or is it something that is based less on measurable facts such as touchy-feely: fun? You may disagree with Gevlons use of an ISK ratio as a metric for success, but it is objective and can be measured without bias. Fun can not be measured objectively. So... what objective measure can you say Goonswarm measures it success by? As a sov holding entity, they still hold sov, yes/no, they hold less or more sov yes/no, if less, was it because of player actions or due to changes to the game, if more, was it due to changes to game or by player actions. As a coalition, were they in war against other coalitions lately yes/no, if so did they win because of player actions or due to game changes. As a group of players that are playing a game, more or less persons are logging in yes/no (this is how you measure fun. There, I have showed you 3 different metrics to evaluate the "Imperium"
What they did was no different than a player who kills his alt in a noob ship over and over in order to pad their kill board. Yes it was an event, but it was an alliance wide killboard padding in order to cover up their losses over the last year.